42-The Large Meteor T-R-A-P investigates the possibilities of calculating and steering a meteor safely down to Earth. 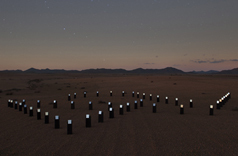 The first antenna array and experimental set up was installed outside the city of Marrakesh, Morocco in February 2014. In 2016 a second array will follow and be installed north of St. Petersburg, Russia. Further info on display at the Chernyshev Central Research Museum of Geological Studies, St. Petersburg, Ru.